Car-Tel Communications: Preparing for the Best Vacation Yet! Preparing for the Best Vacation Yet! I know it’s been Spring, officially, for a while now but, it hasn’t exactly felt like it. Between the largely varying temperatures and the down pour of rain we’ve been getting this week, I think it’s time to plan a vacation. What do you think? Summer is right around the corner and that means the kids are off from school, we’re all feeling eager to soak up the sun and I think a little getaway is just what we need. Maybe you’re thinking a weekend trip or beginning to plan a month long excursion across Europe but either way you are going to need some help with this often tricky task. HAVE NO FEAR, CAR-TEL IS HERE! We’re going to provide some really helpful and interesting applications for travelers that can guide them to making the best decisions from start to finish in planning a trip. One application that will work for everyone, no matter the type of trip they’re taking, is TouristEye. TouristEye gives you the option to choose cities you want to visit and build a customized daily itinerary of the places you want to see. Not only that, you also get to find out about transportation bookings, lodgings as well as travel events. For those of you who are planning a road trip, there are some really great applications that will boost your experience and ensure you don’t miss anything along the way. Triposo offers you the best travel guide for your phone, all you need to do is just download the country guide and it will work offline. The guide includes detailed city maps of top cities which will be great for those long stretches of highways where internet connection is sparse. MTrip uses augmented reality to display tourist attractions in your area, and it guides you to each tourist attraction with directions. mTrip also allows you to share your trip with friends over Facebook or email, with personalized e-postcards. Waze lets join forces with other drivers nearby to outsmart traffic jams, save time and money off gas prices using Waze, a community-based traffic & navigation app. NextExitHistory is an application that lists all of the historical landmarks in your area. By using the GPS in your phone the app will show you what attraction is near you and how to get there! Anyone planning on flying this year has probably heard a bunch of confusing information on when to fly, the best time to purchase your flight tickets and sometimes you don’t want to be bothered with tips and tricks because you’re making a last minute booking. So, to make life a little easier, take a look at these flight booking applications. Travelocity with detailed information on flight and other forms of transportation, Travelocity helps you look for the best option and time to travel, as well as hotels and good deals near your current location. All these can be done with a simple search, with quick booking facility. GateGuru it provides you with real-time flight statuses, airport wait times, even structured list of airport food, as well as shops based on over 30,000 reviews and tips from fellow travelers. Skyscanner lets you compare over 1000 budget and scheduled airlines in seconds, and buy air tickets directly from the airlines or travel agents for the best deals. Priceline is the application pick for last minute travelers. Remember those catchy commercials where they shout “Priceline Negotiator!” with William Shatner? Well for someone looking to book last minute this bidding tool is a great option. Place an offer for a flight or hotel and if accepted you’ll be on your way with a price you are comfortable paying. Because its last minute, any open seat bids are usually accepted for the airline can at least make some money. For the international traveler, there are many obstacles to overcome to ensure you have as little mishaps as possible. 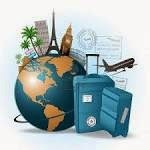 Everything from language, currency, and each country’s travel regulations, there is a lot to consider before heading abroad. A few of the applications we have chosen to feature are going to help with a few of often difficult tasks to master. Google Translate can translate typed or handwritten words just as easily as it can spoken words. Its hosts a dictionary for easy word or phrase look-up and even allows you to save those translations for offline access. Word Lens is a nifty app that will superimpose your language of choice over images written in another language. Using your camera, Word Lens will show a German street sign in English! Currency- Simple converter is a clean and simple interface that will handle over 160 types of currency conversions. You will have offline access and can even check back six months to get a history of the average currency ratio. My TSA provides airline passengers with 24/7 access to the most frequently requested airport security information on any mobile device. Using this app can save passengers time and money by sharing helpful tips to prepare for security before getting to the airport, including knowing what items can and can’t go through security in checked or carry-on baggage. Well, there you have it, folks. These are some of the applications that are going to help you make the most of the vacations you have planned this summer. There are a million and one applications out there and there is something for everyone. Don’t be afraid to download a free application and try it out even if you’re not sure if it will fit your needs- they’re designed to help you make the most of your smartphone so get exploring!